Freezeable dough makes fresh breakfast treats a snap! I’ve long wondered what the difference is between scones and biscuits. Apparently the simplest way to distinguish them is that biscuits should be flaky and scones should have a finer crumb. Quite often, scones also include fruit, which biscuits rarely do. 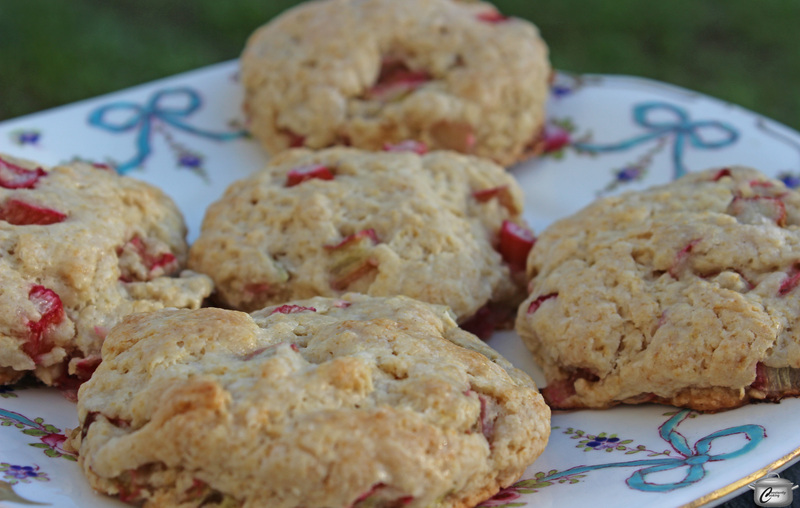 Whether you’re on team biscuit or team scone, you’ll probably love this version which offers tart little pops of rhubarb tucked inside the sweet, creamy scones. Best of all, you can prepare the dough, cut the scones and pop them in the freezer, so you can have fresh scones in mere moments whenever you wish. I served this along with my delightful lemon-thyme loaf for our recent Royal Wedding viewing party and both were a big hit. Now that I know unbaked scones freeze so well, I’ll be sure to tuck a batch of apricot-cardamom cream scones in the freezer as well. Combine flour, baking powder, salt and sugar in a mixing bowl. With the coarse side of a box grater, grate the cold butter into the flour mixture. Toss with your fingers or a fork to combine, breaking apart any clumps of butter. Add rhubarb and stir to blend. Add cream or milk and stir again. At this point it is easiest to gently knead the dough a few times in the bowl to blend the milk in. Add another teaspoon or two of cream or milk if the dough seems dry. Turn dough out onto a lightly floured surface and knead gently 3 – 4 times till it comes together. With your hands, flatten out to 3/4 inch (2 cm) thickness then cut using a sharp knife, biscuit cutter or a drinking glass. Alternatively, you can shape the dough into two 3/4 inch (2 cm) thick rounds and cut each into 6 wedges. Place the cut scones (try to have them not touching each other) on the parchment-lined baking sheet. At this point you can proceed to the baking instructions below OR place the baking tray in the freezer and let rest for 1 hour until the scones are frozen. Transfer scones to a bag or an airtight container and keep in freezer for up to 2 months. When ready to bake, preheat oven to 350F. While oven is heating, remove the scones from the freezer and place on a parchment-lined baking tray. Brush the tops of the scones with a little bit of cream (or milk) and sprinkle lightly with sugar. Bake for 22 – 25 minutes, until tops are just beginning to turn golden (if baking from frozen they may need an extra few minutes). Serve warm or at room temperature. Makes about 12 – 15 scones (depending upon size). 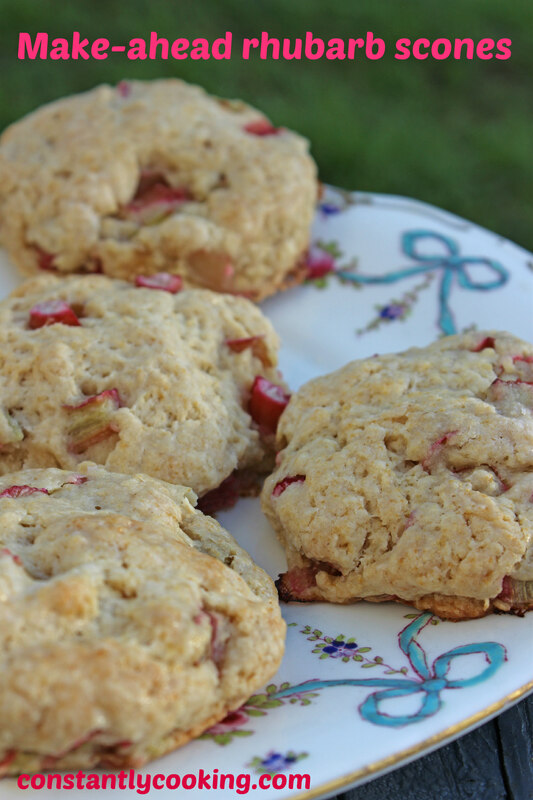 This entry was posted in baking, Breakfast, brunch and tagged bake scones from frozen, biscuits, breakfast, brunch, cream scones, fresh rhubarb, frozen rhubarb, frozen scones, make-ahead, make-ahead scones, Paula Roy, rhubarb, rhubarb scones, scones. Bookmark the permalink.